Angel Readings can offer guidance and clarity as you move forward as an entrepreneur or simply life in general. We all deserve the health, happiness and abundance we desire! There is more to our lives than the work we do. Often we benefit from messages about our health, relationships, finances, etc. We are never alone. Our angels and guides are always with us. Since we enjoy free will and have the gift of choice, the angels cannot intervene without our asking. When you ask for a reading, you are exercising your right of free will and choice. I am honored to serve as an instrument passing on information the angels have for you. This can be in regard to a particular question or simply guidance to move forward. Before each reading, I connect with God, my angels and guides, as well as your angels and guides, to deliver the most valid and useful information for your highest good. Comprehensive multi-deck readings provide valuable insights and guidance regardless of where you are on your journey. Oftentimes the angels’ messages are reminders of what we know at a soul level. You will gain insights and a deep connection to your Spiritual Team so you can release any fears that may be holding you back from your highest potential. You deserve to have the life you want and share your gifts in a way that fulfill your life purpose. I feel blessed for the opportunity to provide this service for you. “When I booked my angel reading with Bonnie I had no idea just how timely it would really be. The messages that came through on the day of my appointment were so appropriate that they could only be Divinely guided! Each one served to remind, reassure and re-affirm all that I knew intuitively but had blocked out because of being in the throes of overwhelm and emotion. “The reading was very accurate, very appropriate and I was very pleasantly surprised. Bonnie is professional. It has been a good advice for this time that is a turning point in my life. “What I love about receiving an Angel Reading with Bonnie Groessl is the way the topics all fitted together and made absolute sense in my current situation. I found the reading to be encouraging, uplifting and helpful for focusing on what’s important in my day to day life. 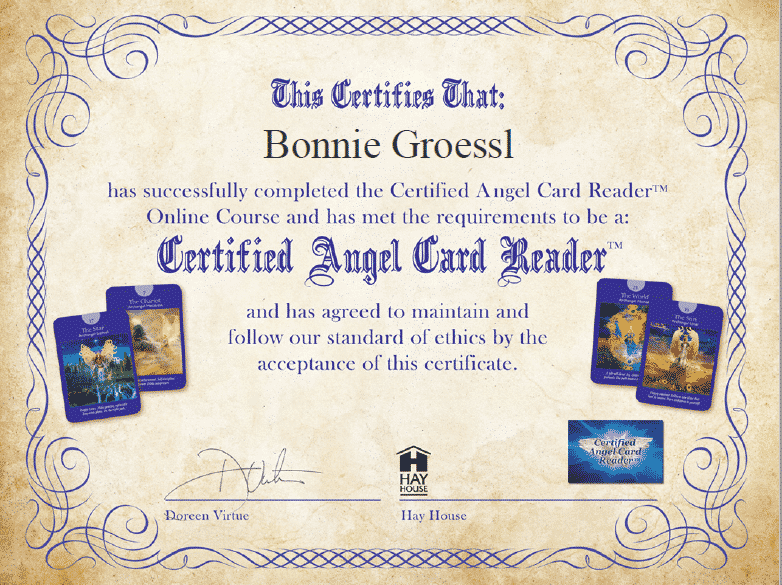 “I just received an Angel Reading with Bonnie Groessl and loved the use of Skype to see and talk to Bonnie directly. Seeing her in person while I was not on camera was a wonderful way to interact with her in the comfort of my home. I was impressed with her explanation of the reading and inspired by the message that was provided to me. She explained each cards purpose and its message in a warm and caring manner. My Angel Card reading was fun because Bonnie knows the cards well and explains their meaning from the heart! “What I love about receiving my Angel reading with Bonnie Groessl is that I felt it was relevant and spoke directly to me. The messages were exactly what I needed to hear, and really reflected what I felt inside. My angel reading reminded me not to worry, and that many great things start out as a seed. I really needed to hear this because I had been working on some projects, and feel discouraged “lack of progress.” I was reminded to take care of myself and connect with my fun and playful side. “Thank you for a lovely angel card reading. You confirmed what I needed before and after my cataract eye surgery. The massages have been very powerful. You spurred me to ask the correct questions of my doctor and allay many of the fears and you reminded me to call in the angels to assist with the rest so that I didn’t have to deal with everything on my own. Surgery went well and I was able to ask for help from several people. As a result of this surgery many other areas of my life are supported with clearer vision as well. “What I love about receiving an Angel Reading with Bonnie Groessl is the joy she shares with each Angel’s Divine message offering guidance to help me learn and grow. I found the reading to be inspiring and relevant as Bonnie described how the Angel’s messages related to my life’s path. The timing of my Angel Reading and messages were “spot on” with emotions whirling in a vortex of family health issues.